Flashlights can be very useful in many different situations, sometimes though you can be caught in a situation where you need one but don’t have one to hand. That’s where the best EDC flashlight (everyday carry) can be very useful as you can keep it with you at all times. Finding the best everyday carry flashlight though involves taking many different factors into account. Due to their size, these won’t be the most powerful flashlights you can buy but some are still able to shine very brightly. Here we will look at all the key features and we have also completed EDC flashlight reviews on the 10 best products on the market. Once you have read this guide, you’ll be confident in knowing what the best flashlight is for you. 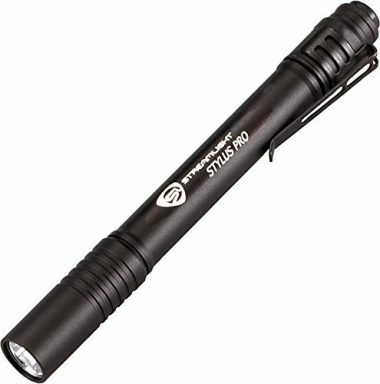 This is a top rated everyday carry flashlight from Streamlight which comes with numerous buying options depending on your needs. 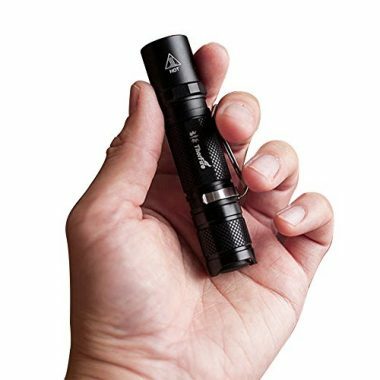 The is one of the best EDC lights due to its very slender size, which would be able to fit into any pocket but can also be clipped on to any piece of clothing. Despite its small size, it’s able to deliver an impressive 90 lumens which will be good enough for many different situations. It comes with a tear-resistant nylon holster and the flashlight itself is durable as it is abrasion, corrosion, scratch and water resistant. 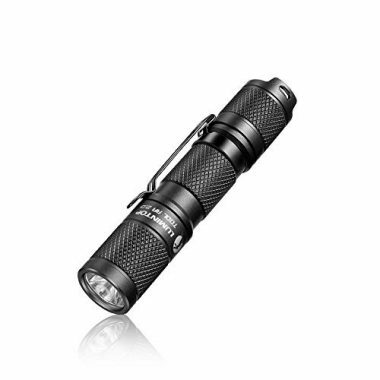 This is a thicker flashlight than the previous product but one which is still highly portable. The small EDC flashlight is able to shine up to 650 lumens for a short period, making it one of the brightest products on the market for the size. That brightness is able to be controlled by the four modes that it has. This flashlight is able to be submerged underwater and it is also impact resistant up to 5 feet and therefore it is very difficult to break. It’s made from military grade aluminum but still remains light and very portable, making it ideal for many different activities. This is another brilliant EDC pocket flashlight from Streamlight which is going to be able to work in many different scenarios to provide you with the shine that you need. It is available with either AAA batteries or you can get it as a rechargeable flashlight too. It has a spring loaded clip to allow easy clip on to your pockets or clothing. It’s 3.5 inches long and only weighs just over an ounce. It is highly durable and abrasion resistant which will withstand a lot of punishment, and it is also water resistant too. 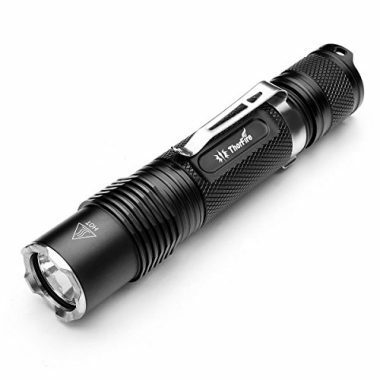 This is another great EDC LED flashlight and one which is going to have a high level of durability, allowing you to take it anywhere without worrying about it breaking. It’s made of aluminum and is small and light enough to be added to a keychain. Despite its small size it is able to shine at 120 lumens and comes with four different light modes as it is able to shine at low, medium and high as well as strobe for emergencies. This is very easy to carry and small enough to not even be noticeable. This flashlight is able to shine at up to 500 lumens when powered by a 14500 battery or 150 lumens when powered by an AA battery. Despite that high amount of capability, it is only 3.7 inches in length and weighs just 1.3 ounces. It features a removable and reversible clip which will be able to easily clip to your clothing or it could also be clipped onto your cap or hat. It comes with an 18 month warranty and ThorFire promise great customer service should anything go wrong. Despite its small size, this a flashlight which will be able to deliver an incredible amount of brightness with its 18650 battery which will be able to shine at 1,070 lumens. It is longer than other products on this list at 4.8 inches but is still going to be portable enough for everyday carry. To go with its huge amount of lumens it is also able to shine up to 650 feet. There are six different modes available of firefly, low, medium, high and turbo. It also has a strobe mode too which is going to help save you if you are in an emergency situation. 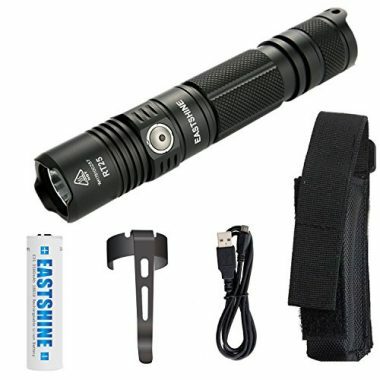 Eastshine have been able to produce this brilliant EDC tactical flashlight which is not only highly durable but able to shine at 1,000 lumens too. It comes with a battery, holster and lanyard but it also comes with replacement parts for the O-ring and the tactical ring too. It has an extreme level of durability as it is waterproof with an IPX8 rating and it is impact resistant up to 1.5 meters too. This is one of the strongest products on the market and will give you peace of mind that you are getting a quality product, which is helped by their 24 month warranty. This is a very compact light which is designed to fit onto your key chain which makes it extremely easy for everyday carry. It is able to shine at 44 meters with a lumens rating of 90, which is going to be able to be very useful for a wide variety of different reasons. It is also highly durable with an IPX8 rating and it is also made from very tough material too. 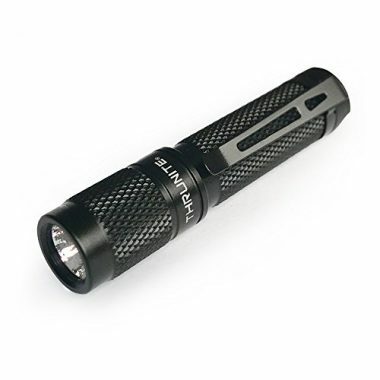 The product also comes with an impressive 5 year warranty and overall this is a brilliant product for those looking for a tiny flashlight which has a lot of capability. 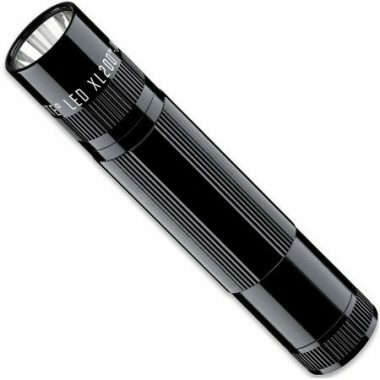 Maglite are another company who have made a highly rated product and this is a flashlight which is able to shine at 172 lumens which will be able to give it a beam distance of up to 138 meters. It features five selectable modes of either high, strobe, night light, signal mode or SOS. It is a very durable product as it is drop resistant up to one meter and is also water resistant, that durability is helped by its durable aluminum construction. It also has an adjustable beam which you would be able to change based on your needs. This is a brilliant EDC flashlight which is highly rated and one which would easily fit into the palm of your hand. It can shine up to 500 lumens with the right battery but the highest modes are only available for a short period of time to prevent it from overheating. It has three standard modes which will be able to shine at 8 or 80 lumens for a lot longer then at 500 for that short period. It also has two other modes of a 0.5 lumen mode and also a strobe light mode for emergencies. When it comes to light the lumens rating is going to be able to give you the best idea of just how bright the light is going to be. Lumens are a measure of how much natural light is going to be able to pass through into your eye, making it a very accurate measure of the brightness of a light. This is a better measure than watts as different types of bulb have different wattage requirements. The higher the lumens level on a light, the brighter the light is going to be. On some products though, you need to look past the headline figure to see the true nature of its brightness. The reason for that is due to the fact that some of these lights will say that they can shine at 1,000 lumens etc. but can only do so for a very short period of time. This size of light doesn’t have the capability to shine very brightly for very long as they quickly become overloaded with heat or power. The amount of lumens that you need largely depends on the general use that you are going to have for it. Anything up to 100 lumens is going to be able to provide you with plenty of light, anything around 250 is good enough for most situations and anything 500 and above will be able to shine with intense brightness. 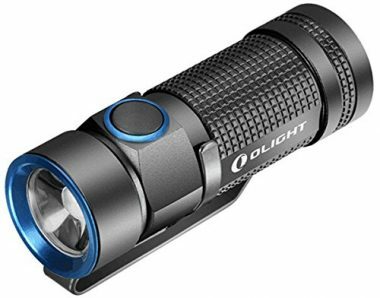 For everyday carry, between 150-250 would be more than useful for most situations with even flashlights below that having a lot of light. It’s always good to look for different mode settings which are going to help you amend to light in order to save battery and make it useful for different situations. When it comes to these types of bulbs, the majority that you will now see on the market are LED and that is due to the levels of quality that they have. While incandescent light bulbs are cheaper, which is why you still commonly see them in households, LED’s other advantages making it the bulb of choice for most flashlights. One of the reasons for that is due to their low level of energy consumption. For the same amount of wattage, and LED bulb will shine a lot brighter which not only means that they are able to use less energy but it also means that they don’t get as hot either. LED bulbs are also a lot more durable as they don’t contain a filament which makes them ideal for flashlights, these types of bulbs also have a much longer lifespan and will be able to last for tens of thousands of hours, which means that one LED lightbulb will usually last for the full life of the flashlight. There are other types of bulb available in other types of light but for these types of EDC flashlights, LED is going to be the best option available. The slight extra price that you pay for an LED bulb over an incandescent one is overwhelmingly outweighed by the advantages that it has. Battery types are one area where there can be a lot of difference when it comes to these types of flashlight. A lot of them will use the typical types of AA or AAA battery which is able to produce a good level of battery life and a decent level of power. There are other types of battery available which are a similar shape and size but able to deliver a lot more power. These batteries are great at being able to get the highest amount of lumens from their flashlight when compared to the more traditional batteries. There are also CR123 batteries available which have a good lifespan will be able to shine very brightly which makes them a very good option and one that a lot of flashlights will carry but they are also generally going to be more on the expensive side. When it comes to batteries, the brand is also going to be important as there is a big difference between the lifespan of cheap batteries and the higher end batteries on the market. It is always a good idea to buy a great battery to make sure that it lasts for as long as possible. If you are going to be carrying a flashlight everyday then sooner or later you are going to need to test its waterproof abilities, whether that is trying to use it in the rain or dropping it in a puddle. It’s important to have some type of resistance against it so that you are able to prevent it from breaking as soon as it gets wet. In terms of water resistance, you will often see it listed as an ‘IPX’ rating which is a waterproof rating system which goes from 0 to 8. An IPX rating of 0 will mean that a device is immediately destroyed when it comes into contact with water and an 8 rating will mean that it’s submersible at depths of over a meter. 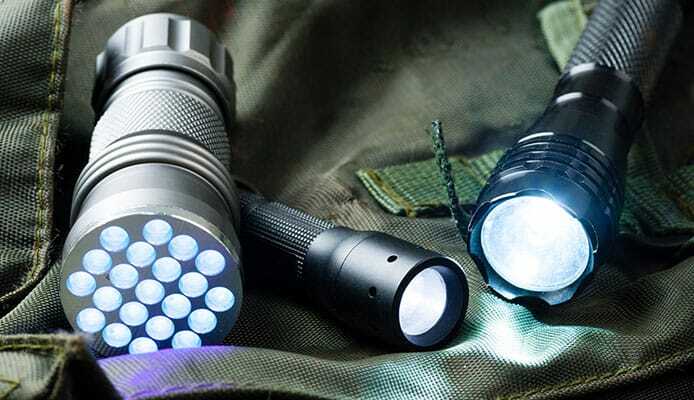 IPX3 will offer of resistance but when it comes to flashlights you want to be looking for at least an IPX4 rating and anything above that will be able to offer increasing levels of resistance until IPX7 which is a fully waterproof rating where it can be submerged for at least 30 minutes in a depth of one meter. If you are going to be on or near water then it is a good idea to get a flashlight which is waterproof or at least can be quickly submerged without the water affecting the device. In most instances, a good level of water resistance is going to be more than enough to make sure that your flashlight remains working. One common feature of these flashlights that we have reviewed here is that they are very well made with a durable level of construction. With these types of compact flashlights, they are generally made from an aluminum body which gives it a great degree of strength but is also quite lightweight too. That aluminum will usually give the device a good level of impact resistance and will also help it to be scratch and abrasion resistant too. The body of the flashlight will also need groves built into it in order to give it a good level of grip and help it to have a non-slip surface. The lens also plays a big role in the construction of the flashlight as you want it to be able to let as much light through as possible but also be durable and resistant to scratches. These can be made out of either high quality glass or polycarbonate but it’s important that they have those key features. Overall these devices tend to have a very durable construction with O-rings in place to keep the flashlight watertight. It’s always a good idea to inspect these rings to make sure they are not getting dry and if they are, then lubrication can be applied. Being able to adjust the beam is a good feature to have but it is usually only found on devices that have a higher level of brightness. This is due to the fact that being able to adjust the focus on a device which has a low level of lumens isn’t going to be highly effective. This level of adjustability though makes the flashlight more versatile and able to give you a wide area in front of you which is lit up or the ability to shine something from very far away. This can be useful in different situations whether you are inside or outside. This is added to if you are able to adjust the brightness of the light too as this could mean that the flashlight is good enough to be able to help you find a path if you are out there hiking at night or help you read a book at night, but a camping lantern is a great option for this. Having this adjustable level of beam is generally only found on the slightly larger models which would be able to fit into your pocket but not really a key ring. For these types of flashlight it is not a vital feature and is probably more useful to have a torch with multiple brightness settings, which most of them have. 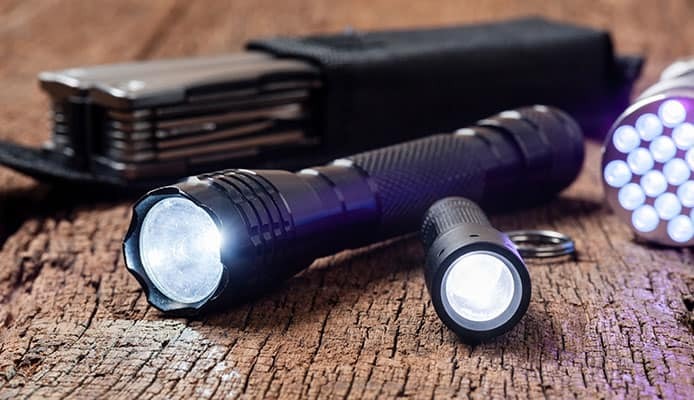 If you want a flashlight for everyday carry then it’s likely that you partly want to give yourself a flashlight should you ever find yourself in an emergency situation. Even if you are not, it’s always good to be prepared for one. A normal flashlight is going to be useful in emergency situations as you will always have that light available but if it has flashing capabilities then you are going to be able to attract attention with your torch which will work to get you help as soon as possible. A lot of flashlights will come with numerous different modes which may include either or both of strobe and SOS settings. This is going to help alert the attention of anyone close by that you are in an emergency situation. You never know when this is going to help you but it is great to have that backup option should you ever need it. If you have a simple device which doesn’t have these settings then you would have the option to make it flash manually. Everyone is going to have their own preferences when it comes to everyday carry on where you want to place your items and how easy you want to be able to access them. Some people will want to attach their flashlight to a key ring while other will be happy to just keep them in a pocket. 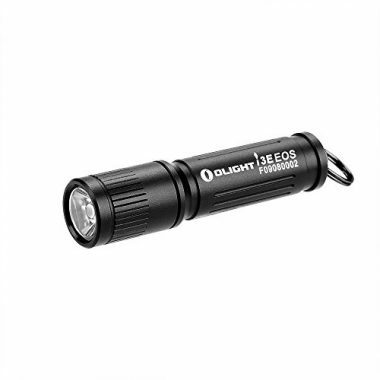 If you are going to be looking for a flashlight that is going to fit on your key ring then you need to look for a light which is small enough and one which has that attachment available on it. Only the smallest devices will have this as others would just be too large for your key set. One very useful attachment feature though is a spring loaded clip. This would mean that the light could be attached to a zipper or a pocket but many of these clips are also reversible and can be attached to a cap or a hat to give you a hands-free light. Others though wouldn’t want an attachment feature at all and might prefer a simple light which they can put in your pocket. Most products come with spring loaded clips but a lot of them can be taken off if this is your preference. One feature which generally comes down to personal preference is the switch option and there are four different ways that we see here that a flashlight can be switched on. In most traditional flashlights why will have a button just under the head which is common but smaller lights sometimes have variations on this. A common one is to have a button on the tail of the device which is easy to switch on when you are using a compact light as this is conveniently placed and can easily be clicked through the various modes until you have the one that you want. Other ways of switching on the device can come with the head as some lights can be switched on by twisting the head of them while others can be put on by sliding the head of the torch. This is generally down to personal preference and which one is going to feel the most comfortable when it’s in your hand. Q: What is an EDC Flashlight? A: EDC is shorthand for everyday carry and these flashlights are designed to be small and portable enough for them to be taken with someone everyday as they would be able to keep them in their pockets or attach it to a key ring. This means that it is always on hand to be used on any occasion which can be useful in a wide number of different scenarios. Some people love to be prepared and having an EDC flashlight on you at all times could prove to be very useful. A: A lumen is a measure of light which hits the naked eye. This is a good measurement as it only takes a reading of the brightness that we can see. Light has many wavelengths but we can’t see them all and a lumen is able to register what we can’t see. Watts were often used as a measure of light intensity but this is now redundant as different bulbs have different wattage and watts are a measure of power and not light. That means that it is an unreliable means of registering light. Lumens, on the other hand, is a very good measure of light. An incandescent bulb will be able to produce around 14 lumens per watt whereas an LED bulb would be able to produce around 74 lumens. That is why lumens is the best and most accurate measurement of these lights. Q: What Are The Benefits Of Using An EDC? A: An EDC is simply incredibly easy to carry and take around with you to wherever you need to go. They are highly compact which means that they can be with you at all times which can be useful for many different situations. 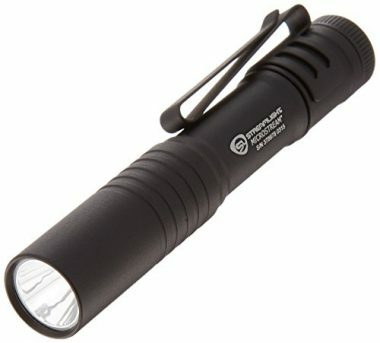 I’m sure we have all been in a situation where we wished we had a flashlight but with an EDC, that is never a problem. It allows you to have that light wherever you need it and that could be something simple, or it could well be an emergency. As we have seen, having an EDC flashlight on you is going to come in useful on many different occasions. Whether you are backpacking and just want a flashlight as a back-up or whether you simply want one in case of an emergency situation, you will always find a use for one. 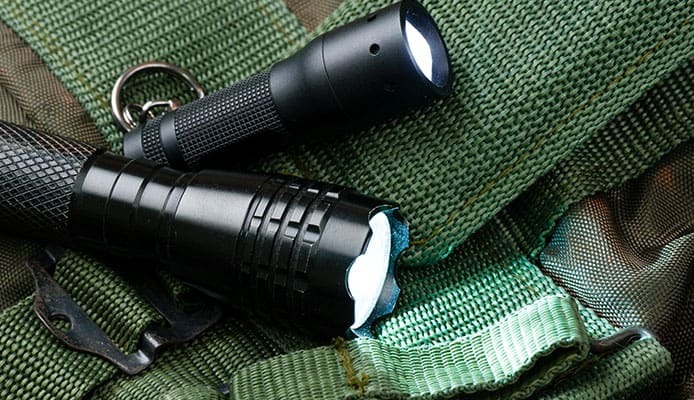 Compact flashlights have never been better and these products give you an incredible amount of functionality for their size. Some of them are incredibly bright but often give you the option to control the brightness of the light with some of them giving you the options to adjust the focus of the beam too. This added functionality makes them even more useful to take around with you. In order to get the perfect one for you, it’s important to asses if you have any specific needs and also which features you think are going to be most important. There are features such as waterproofing and shock-resistance that differ in importance depending on where you are and how you are using it. Other features such as the switch and the attachments are going to be a more personal choice depending on your preferences. It’s always important to know exactly the features that you want and get a light which is going to be able to tick all of your boxes. When it does, you’ll be left with the perfect EDC light which is going to be able to help you out time and time again. Hopefully this guide has given you all the information that you need and that you will now be able to choose the best EDC flashlight with confidence.